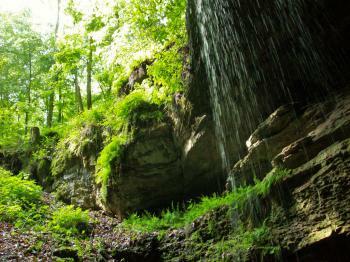 Mammoth Cave National Park holds the longest cave system in the world. Its known passages extend to 365 miles. 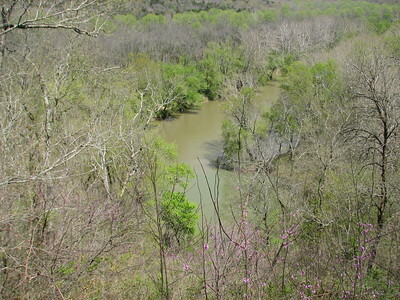 The limestone caves were carved by the Green River and its tributaries. The caves were formed over 100 million years ago and the geological process is still continuing. Most types of cave formation can be found here. Some dripstone is present, notably at a site called "Frozen Niagara". Fossils are also distributed throughout the rocks. The endangered Kentucky cave shrimp, a sightless albino shrimp, lives in the caves. The park derives its name "Mammoth" from its gigantic size, not because mammoths ever lived there. I had stayed overnight in a Bed&Breakfast in nearby Brownsville, so I could have an early start visiting the park. Arriving at 9 am at the visitor center, there still were plenty of tours to choose from. I picked the New Entrance tour, a 2 hour tour that uses a man made entrance from the 1920s to get into the caves. The fee is 12 US dollar. Getting in this way is quite strenuous, and not for the faint hearted or those with a fear of heights. The passages are narrow and of course it's often dark and slippery. I found much of the talk of the ranger geared to children, of which there were many on the tour, and only mildly interesting. As I have said in other reviews: I'm not a fan of dripstone, but there a so many sites displaying dripstone on the List that I just have to see them again and again. The most interesting thing I heard or saw on this tour is the story of George Morrison, a local entrepreneur who in the 1920s had blown his own way into the cave system and conducted tours from there. He also built a hotel near this "New Entrance" and posted roadside signs to lure visitors away from the main entrance. Later that day I did a short hike on the Turnhole Bend Trail. The National Park above ground is a pleasure to be in, certainly on a warm day. This walk took me to an overview of the Green River. Green it looks indeed, a mighty river that was responsible for carving out the cave system millions of years ago. I took the tour, and with the exception of bashing my head in the ceiling of the smaller tunnels, I really enjoyed it. I camped here in 2009. Overall beautiful park both above and below ground. Certainly one of the most impressive caves I've ever seen. There are many different cave excursions you can choose in your tour. Hopefully, I will get another opportunity to see more of the cave tours in the future as 2 is pretty much all you can fit in one day. I drove with friends from Wisconsin to Kentucky. Mammoth Cave was the end site on our trip, and it was very enjoyable touring the caves and camping in the park. Be careful about Racoons though, they want your food! Protect the animals and never feed them or leave food out. I think mammoth cave is beautiful.the beautiful stalactites and stalagmites.Its twisting paths and tight spaces.when i was four i was scared to cross over the bottomles pit.But when isaw the beautiful formations i was amazed.When i left the cave I was sad because it was so fascinating. I've been to Mammoth Cave and I'd really like to go back because I loved it! The cave was very interesting with all of it's history. The long hallways seemed endless and the deep blackness where it goes down hundreds of feet made it kinda spooky. I loved going to Mammoth Cave. That cave has a lot of history and mystery to it. I loved the whole experience even though it was very tight and slippery at some points. But ANYONE who loves adventure, learning some about history, or/and likes to get kinda spooked, would LOVE Mammoth Cave. To me, walking through the cave was kinda scary, but I was seven when I went. But it wasn't scary enough to make me wanna stop, it was wayyyyy too fansinating to me! The history with stories, the deep blackness and the endless hallways made me leave Mammoth Cave in awe. My trip was VERY satisfying and the tourism was great! I loved the HISTORY! The whole thing was really wonderful and wayyyy interesting! I'd love to go back someday and I'd recommend the Mammoth Cave to anyone. Mammoth Cave is long, eerie, musty, and mysterious. It is not going to overwhelm you with natural beauty, as you'll find at Carlsbad Caverns. At Mammoth, you'll be amazed by the sheer length of the twisting hallways, and the human history, including people thousands of years ago who ventured many miles into the cave. Their artifacts remain as ghostly reminders. If you have a chance to take the tour including the old TB sanitarium, you'll be reminded of the nice, easy lives so many of us lead today. In the 1840's, these desparate people actually lived down there for a while, in a huge and ugly hall, blackened by candle smoke. They obviously did not find a cure. About the only truly beautiful place on the tourist routes of Mammoth is the Frozen Niagara section, far from the natural entrance but easily accessible by a tour bus ride. The park is gorgeous eastern hardwood forest with many trails. The campground is excellent, too. Mammoth is a place to marvel at nature's miles and miles and miles of tunnels in limestone, and also at the humans who have given it a fascinating recent history. Mummies: Several pre-Columbian mummies have been found preserved.